Bamboo poles, decorative bamboo sticks and bamboo canes are manufactured with only the highest grade Tonkin and Moso bamboo. Rated commercial grade and harvested from 3-5 years to achieve maximum wall thickness and density. A very versatile building product, our bamboo poles and bamboo sticks are suitable for indoor, outdoor and furniture building uses. Bamboo Poles and bamboo sticks come in a variety of lengths and diameters in natural, black, speckled, carbonized and natural burnt. Note: customers are reminded, all bamboo poles will taper to some extent, the longer the pole the greater the taper. Bamboo poles are measured for diameter at their wider end, between the first and second node. Please note all sizes are approximate. Being one of the fastest growing natural resources available today, bamboo products have exceedingly increased in popularity over the last few years in North America and surrounding countries. Because they are so versatile and durable, natural bamboo items have been used in many different types of building materials as well as some decorative options for around the home. Some of the most popular uses for bamboo include: fences, space dividers inside and outside of the home, decor, art pieces, home and garden landscapes and more. Bamboo poles, sticks and canes can transform and enhance homeowner yards, gardens and landscapes. They also have many uses for inside of the home. They are wonderful to use for privacy, as decorations and best of all, they are environmentally friendly. If you shop online for bamboo poles, sticks and canes, you will find opportunities to buy these items in bulk with options for wholesale prices, fast delivery and free delivery on most products. They can come in many different dimensions, colors and sizes. The most common sizes are: 3 foot, 4 foot, 5 foot 8 foot and 10 foot options. The top colors to choose from are natural, carbonized, speckled, black and tigerboo. Bamboo products like poles, sticks and canes are wonderful for using as privacy fences, decor and more artifacts inside and outside of the home. If you are looking to have that peaceful and Zen-like backyard space, choosing some bamboo border fencing or edging in a natural and neutral color would be a great way to accomplish this. You could even buy some fencing or bamboo poles to use as a privacy fence, pool or pond surround or use these items to section off areas that you would like to shelter off from the eyes (perhaps that unsightly air conditioner or shed). As for indoor uses, bamboo poles, canes and sticks make for great decor pieces. Perhaps you’ve seen some recently in modern shops or homes. You can place some different colored bamboo poles in a nice large vase for a great floor or office desk piece. Other options could be to use bamboo items as a headboard, wall divider or to section of different areas around the home. Bamboo is an environmentally friendly and sustainable resource that has been used as decor and building materials for thousands of years in Asian cultures. More recently, North America and surrounding areas have become a little more environmentally conscious and have started using bamboo to replace wood products. Bamboo grows insanely fast and produces high yields. This means it can be harvested quickly and frequently without contributing to deforestation consequences; unlike regular hardwoods. This versatile resource is actually a lot stronger than hardwood. Its long lasting and durable properties make it a popular and sustainable option for uses in building homes, fences and other items around the home and garden. Bamboo fencing and poles are some of the most popular items being manufactured and shipped online today as there are many different uses for this wonderful green resource around the home and garden space. Bamboo poles come in a variety of color options and styles. They are also very durable which allows them to be used in a multitude of ways around the home and garden. There are no limits when it comes to the many uses for bamboo poles. 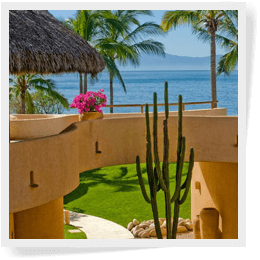 Around the garden: furniture, landscaping patterns, edging, privacy fencing, deck decor, pool and pond surrounds, vegetation backdrops and more. Around the home: rugs, mats, chairs, room dividers, screens, railings, decor, art pieces, headboards and more. Bamboo's natural longevity and beauty make it an exceptional product for decor and home building uses. 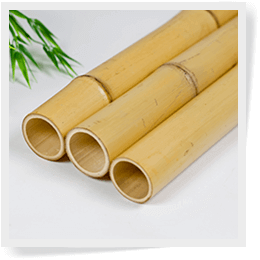 Natural Bamboo Poles - Natural tan bamboo poles are loved all over the world. They can add a naturally decorative accent but be minimalist at the same time. You can buy these poles in different sizes and widths and combine them to create a neat looking simple decorative art piece. You can dye natural bamboo poles and paint them to fit your space and design theme accordingly. Carbonized Bamboo Poles - Carbonized bamboo poles come in more of a rich tone and amber colors with darker shadow accents around the nodes. They work well with contemporary and modern styles of decor inside the home. They can be cut and manipulated to many different lengths to fit your desired project or art piece. 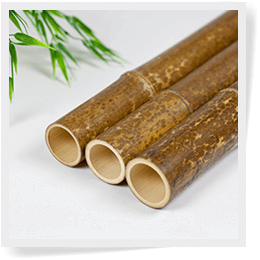 Speckled Bamboo Poles - Speckled bamboo is a natural bamboo with darker spots surrounding the nodes. This type of bamboo also works well for any type of art project or function around the home. You can use them for privacy screens, vase decorations, wall accent pieces, picture frames and much more. They can be easily bought in bulk and shipped directly to your door. 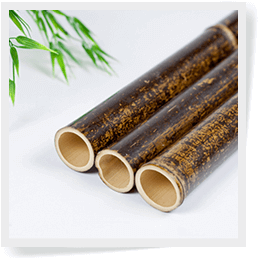 Black Bamboo Poles - Black bamboo is natural bamboo that has been stained or dyed. The darker black color of these bamboo poles will allow you to create many different decor items around the home. You can use black bamboo poles for room decor, privacy dividers, art frames, mirror frames and more. You can have black bamboo poles shipped in different quantities and lengths delivered quickly and straight to your door. Split Bamboo Poles - Split bamboo poles are natural bamboo poles that have been split down the middle. 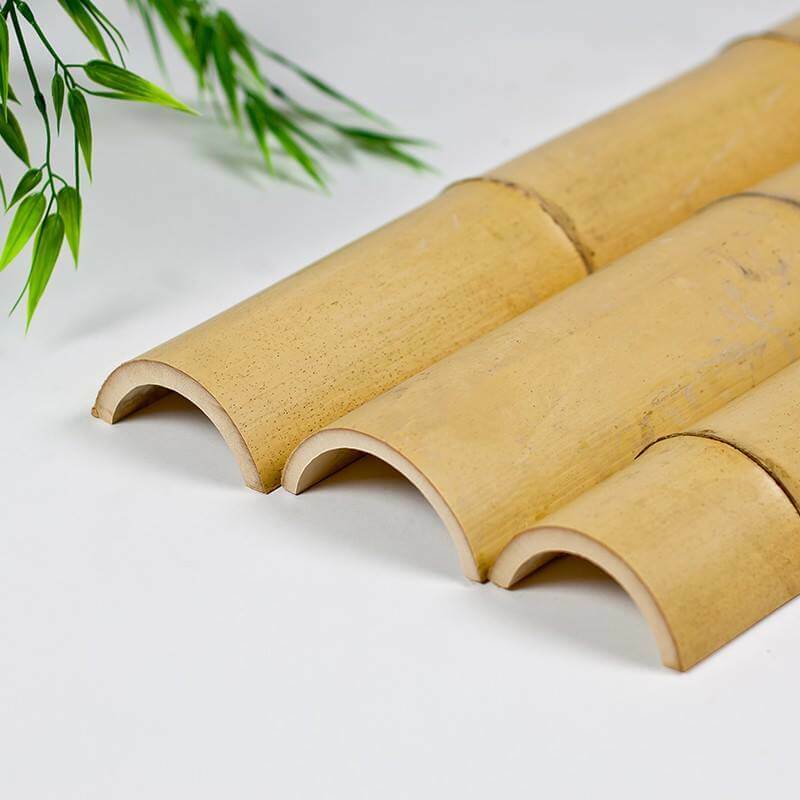 Split bamboo poles (also called half round bamboo poles) are often used for fences, wall decor, furniture and more. They are even lighter in weight compared to full round bamboo poles and may be easier to use for certain projects like wall mounted pieces. Since you have a flat edge to play with, they are easier to piece together if you only need to see one edge. Please note the bamboo will have color variations due to the fact that it is a natural product. Bamboo is know to split at times.